Pauian Archiland edges Pelita Jaya 79-55 in East Inter-Subzone Qualifications opener. Pauian posted a 20-11 run at the start and added a 26-11 surge in the second frame. Pauian also won the third period 20-15, while Pelita Jaya closed the game with an 18-13 run at the end. Yao-Tsung Lin (195-F-90) top-scored for the winners with 19 points, while Chin-Pang Lin netted 15. Wei-Ju Chien (185-G/F-92) scored 11 and Tai-Hao Wu (203-F/C-85, college: BYU-Hawaii) delivered 8. 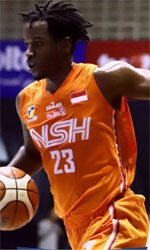 Hardianus Lakudu (175-PG-92) and Wendha Wijaya (181-PG-82) replied with 10 points each in a loss.